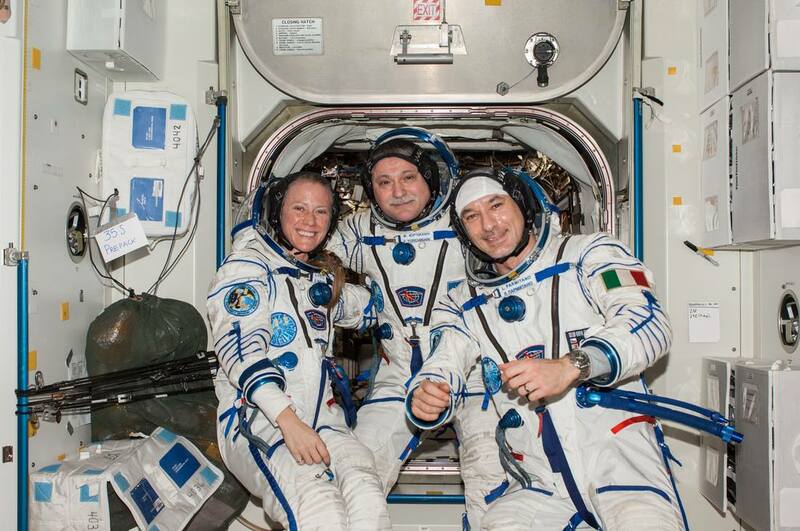 Karen, Fyodor and LUca are gearing up for their return to earth. 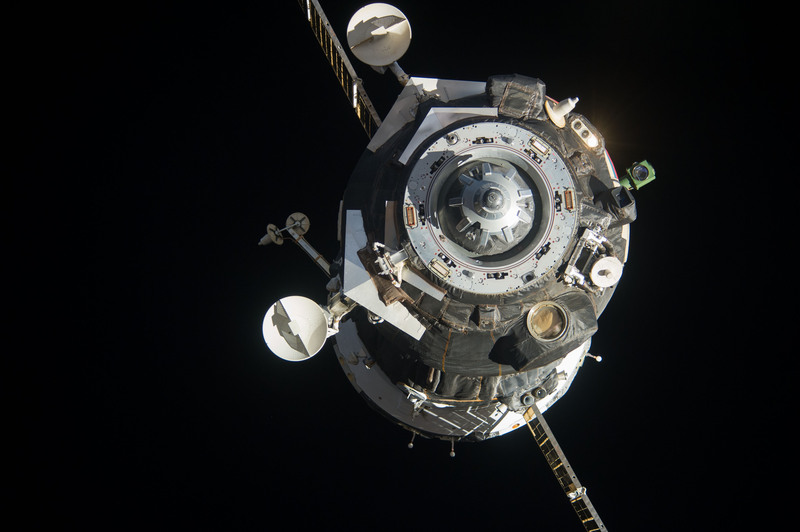 Closing the hatch of the Soyuz is like closing the the cover of a just-finished book. The sense of abandonment is surprising, until I realise that a last page is nothing more than an invitation to open the first page of a next book. I console myself with this thought as I take off my ‘civilian’ clothes, a simple T-shirt and trousers, and put on my clothes for the journey back home. Two special garments called Kentavr were developed in Russia for the return journey: a pair of knee-high socks and elastic shorts that wrap around the calves, buttocks and thighs to minimise the flow of blood towards the lower part of the body avoiding decreased blood flow to the head. I wear them directly on the skin. I set up a belt with electrodes around my chest that record my heartbeat, the same I had when I arrived at the International Space Station. On top of this, I wear the Camelia undergarment , a cotton bodysuit . I slowly start to put on my Sokol space suit, the procedure is not as complex as the EMU suit used in spacewalks but just as important. Karen helps me stabilise the torso while I slip into the inner pressure-layer, then I hook up the headphone cables and the biomedical band. I take my time to seal myself in the suit, pulling every strap tight and checking each coupling carefully. Meanwhile, Fyodor has completed the initial checks of the spacecraft and the computer is switched on and ready to react to our inputs. Once again I am the first to get to my seat, microgravity makes the task easier and I remember how hard it was to go through the same movements on ground, just six months ago . It takes Karen just a few minutes to be ready in her right-hand seat and then it is Fyodor’s turn: when he switches the Soyuz living-module lights off it will be the last time. Following the procedures in our textbooks , Fyodor seals the inner hatch and then fastens his seatbelt. How many times have I reenacted this scene during simulation? The sense of déjà vu is lessened by the Olympic torch that is firmly fastened to the structure of the reentry capsule between myself and the commander. The undocking sequence will start in a few hours but we are already busy with leak checks. They are identical to the redocking checks performed just a week ago and Fyodor, Karen and I sail through the procedure. Everything works perfectly, no surprises – we would not be happy if there were. 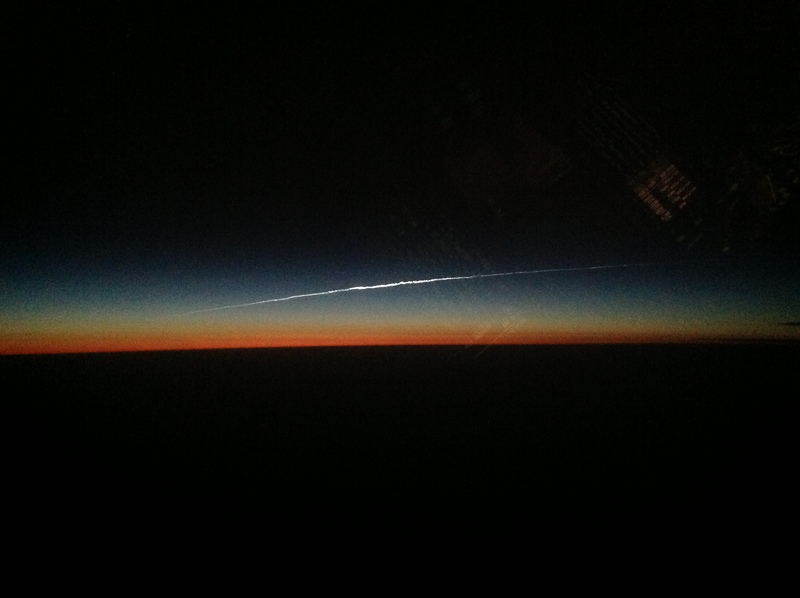 The Soyuz TMA-09M spacecraft departs from the International Space Station. Our ground controller follows every move through telemetry and confirms our comments and repeats the timing of commands to activate the undocking sequence. It is my privilege, as flight engineer, to send the commands while Fyodor visually inspects the undocking. I start the countdown in Russian at the scheduled time and give the go-ahead for start sequence. The hum of electric motors as the Soyuz hooks are opened cannot be heard through the headphones but within a few minutes we perceive a slight movement of the aircraft. We are undocked . The Soyuz turns on its secondary engines to ensure separation. For about two orbits we will drift freely away from the station. I cannot describe the feeling I had during detachment, I am glad that I cannot see the Space Station as its contours fade until they disappear. Maybe I will never be truly ready to leave the International Space Station. Maybe I will have never really left it. The two orbits pass with regular parameter checks and review of reentry procedures. This is Fyodor’s third Soyuz flight and he takes advantage of this quieter moment to remind us once again how to prepare for the most challenging phases. I look out of my porthole to check spacecraft position but the clouds, mixed with the snow of the glaciers amongst the peaks that fly past beneath me seize my mind. I am overcome with the same intensity when, six months ago, my eyes gazed upon the same contrast of blue and white. Then it is time: like hundreds of times in simulations I settle into my seat until I feel the profile along my back, tightening the seatbelts with all my strength. I use my gloved fingers to raise the protective cover over the buttons I will press in case of emergency – I do not want any obstructions in case I am forced to use them. While Fyodor configures his screen to send images to the Control Center, I start another countdown in Russian. The Soyuz responds perfectly , every indicator is right on schedule: a vibration verifies that the main thruster has been activated and is confirmed by a light on my screen. For a little over four minutes, the commander reads the parameters of deceleration while I compare them with previously calculated values. The difference is minimal. We all wait for the computer to calculate a speed of 128 m/s and automatic engine shutdown. Another countdown: “5 , 4, 3 , 2, 1… 1 , 2, 3…” my fingers reach for the manual override button but procedure instructs me to wait before pressing it. 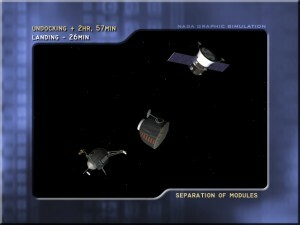 After three, long seconds , the engine is switched off by the computer and I relax: the separation sequence will be as planned and performed automatically. It is only a matter of minutes and the instruments on our screens show that all is going well. The three-second delay will be easily corrected during atmospheric reentry . 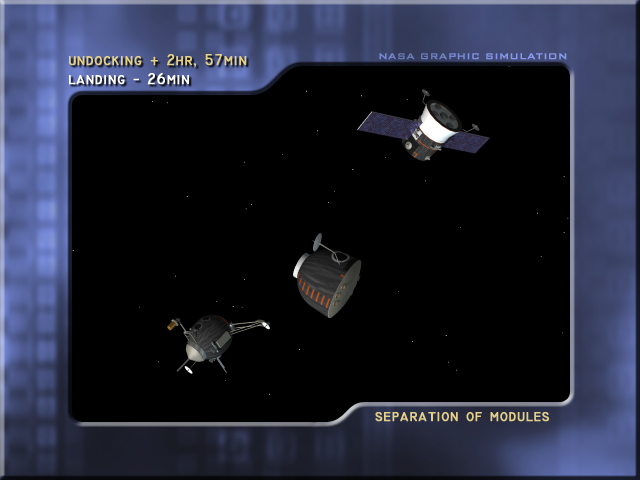 As scheduled, like a perfectly calibrated watch, the computer begins the separation sequence, accompanied by various alarms, lights and sounds that, after hundreds of simulations, do not surprise me but are a welcome confirmation that everything is proceeding normally. The screen formations change automatically but I have to do some checks before returning to the page about landing of the Soyuz booklet. My hands move automatically while I check that the main parachute has been selected, then I open the valves that allow ventilation after landing and close the valve that until recently let oxygen from the service module into our suits. The service module has left us to turn into a wreck as it disintegrates in the plasma that will soon surround us. 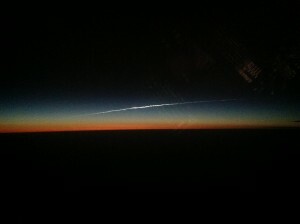 Soyuz TMA-09M seen from BA15. Notice aircraft cockpit reflection. My last look outside from space shows that we are rotating slowly as expected. Everything out there is black. A blackness I know well. I glance at the instruments: I want to be sure to catch the entry into the atmosphere that the spacecraft calculates based on our deceleration. At the exact moment that the computer indicates reentry I turn my head in the helmet of my Sokol spacesuit to look outside: a white, dense light flashes at me through the window as if the Soyuz were sinking into a thick liquid. I begin to feel the pull of gravity. I read the data on my screen, confirming the readings read aloud by Fyodor. At just 0.5 g I feel crushed by a giant hand that makes me sink into my seat. With my right arm I change the computer screen to a different formation to read the parameters of the onboard systems and it feels as if I was lifting someone else’s arm. When I read 2 g it is difficult to breathe, my chest is crushed by the weight of my suit and my body but that is just the beginning. I make an effort to look outside again and it is worth it: the spectacle of colour waiting for me outside the porthole hypnotises me – red and orange dominate the field of view and at our supersonic speed I see the remains of our heat shield burning as it passes by like a meteorite along the direction of flight , disintegrating at 1600 degrees of white heat. “Karen, look, look outside …”, that is all I manage say. The numbers continue to flow relentlessly , 2.5 g , 3 g, 4 g, 4.5 g. Now I feel the weight of the skin on my throat crushing my larynx and when I read the peak measurement at 4.91 g, I find it hard to speak the parameters. The g forces last just a few, but long, moments. When deceleration decreases it is greeted by relief from all of us . Now we are falling through Earth’s atmosphere at about 400 m/s and at regular intervals Fyodor tries radio contact, hoping to catch the signal of rescue helicopters. When the parachute opens it feels like being on a roller coaster. The spaceship is tossed from side to side while rotating on its axis at 13° per second but I feel great and I laugh from pure joy. The last events occur rapidly: on the computer screen I observe the cabin depressurisation and I know that soon the remains of the heat shield that protected us from the infernal heat of the plasma will be released. With a jerk we get rid of it, then the three, pneumatically cushioned seats are released and move towards the cockpit in preparation for the impact of landing. The rescue helicopters communicate our altitude- 2000 meters, 1500 … with surprising speed it is time to tighten our seat belts for the last time. “Brace for impact!”. I fill my lungs with air, close my mouth, stiffen all the muscles in my neck trying to push into my seat. The impact, which coincides with the firing of the retro-thrusters, empties my lungs and reverberates through my body while our seats collapse, reducing the deceleration from about 20 g to 5 g. What remains of our Soyuz bounces a couple of times before stopping on its side. Inside, we look around, three thumbs raised in front of us to confirm that we are fine. I am laughing like a child. I feel a strong sense of almost palindromic symmetry of what I experienced. 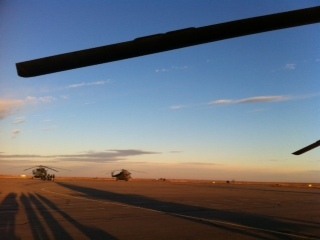 A six-hour flight brought me to the Station in May. Six hours ago I was still on board. Now I am back. Nothing has changed – nothing will ever be the same. Da qualche giorno mia figlia (9 anni) mi chiedeva se avresti raccontato il tuo ritorno! Grazie Luca per avere condiviso la tua avventura con noi e per averci fatto sognare insieme. Grande Luca! Mi emoziono sempre quando racconti perchè sei estremamente dettagliato che sembra di esserci, di viverlo… ma c’eravamo tutti con te quel giorno… Grazie infinite! Reading this one was intense and my eyes are watery now with emotion. Great writing ! What a ride! Wow! Glad you, Karen, and Fyodor are all doing well. Bentornati Luca! Sei tu a rendere storica questa giornata per gli italiani! although I am following the adventures of former station Mir cosmonauts, it is the first time I can read such a great testimony of what it is from a human point of view to get back within a Soyouz ! Thank you so much for letting us know how it is there, and for you ham radio activity during your flight. I wish you the very best on earth now. Surely Luca’ll be right and nothing will ever be the same. Thanks again for bringing it on the way home. You have managed to live a wonderful dream awake! “Ciao Luca!”. Carissimo Luca, ho seguito il vs rientro la notte del 11 c.m .Ho cercato d’ immaginare in quelle ore di trepida attesa ,cosa stavate provando all’interno di quella capsula.Virtualmente, grazie a TE ho viaggiato sulla ISS e mi mancava l’emozione del ritorno,eccolo il tuo regalo speciale. ” ma io mi sento benissimo e rido di pura gioia. “… e qui mi è scesa la lacrima dall’emozione ed ho iniziato a ridere anch’io ricordando la tua espressione euforica quando ti hanno estratto dalla Soyuz). J’adore tes criés du cœur, il y a des expériences trop fortes, tellement exceptionnelles. Maintenant est de savoir se que Tu en feras. Non ? Wao ! É un racconto che lascia proprio senza fiato, quello che ci hai regalato stavolta. Noi eravamo lì, con te, in quei momenti, attraverso gli aggiornamenti di Kathy, le dirette dei vari siti web, e di rainews24. Preoccupati, come lo si può essere per uno di famiglia. Un bravo ragazzo che si è presentato a noi in modo umile e piano piano ci ha resi partecipi di tutti gli aspetti di un’avventura particolare. La prima volta che ti commentai il blog ti dissi che le tue avventure erano meglio di qualsiasi altra serie televisiva. Ora che è finita la prima serie, possiamo dunque sperare in quella seguente ? È l’incipit del nuovo brano sul blog ? Luca, le emozioni che si provano nel leggere il tuo racconto sono fortissime…grazie per la tua unicità!! No amount of watching hours of YouTube videos of the Soyuz could possibly convey what you said in a few words. Thank you for taking me there with you – and welcome back to earth! Dopo 17 gg mi ritrovo qua con tutto il carico emotivo di quel momento. L’emozione di quella sera/notte credo che sia irripetibile e, a quanto pare, sempre viva. La giusta definizione per descrivere come mi sentivo è: tristemente felice. Triste perché si stava chiudendo un capitolo importantissimo, anche per me stessa, e felice perché finalmente avresti riabbracciato i tuoi cari. Il momento dei saluti, vederti salire nella Soyuz e la chiusura del portello, è stata la fase critica: lacrimoni a fiumi, che non puoi immaginare. Trasformata poi in ansia durante il distacco, la discesa, e fino a quando non ti hanno tirato fuori (minuti interminabili). A quel punto sono passata alla gioia estrema: il nostro “SuperEroe” che ancora una volta si mostrava per quello che era. 🙂 Nonostante fosse la tua prima volta, ed una 500 contro un Tir non è proprio il massimo della vita, in cuor mio e conoscendoti, ero certa che saresti uscito col sorriso, altrimenti non saresti stato tu. Sei una forza della Natura! Eri il ritratto della felicità. Un sorrisone enorme, raggiante, carico, prontissimo per fare una maratona… “quanto sei Grande!” è quello che ho pensato. E per un attimo mi sono messa nei panni dei tuoi genitori, vedendo il loro figlio in che modo aveva concluso la sua missione: così come l’aveva iniziata… con quanta forza, grinta e felicità. Stavi ancora sognando, e si vedeva. Mi sono sentita immensamente orgogliosa io che sono un minuscolo puntino sparso nel mondo, figuriamoci la tua famiglia. Unico e Speciale, te lo dirò sempre. Tu che ti impegni e io qua a prenderti in giro… Ma anche questa volta, caro Luca, mi costringi a ripetere con convinzione il mio mantra: “Questo non è @Volare ! Questo è Cadere con Stile!”. Anzi… Con Italian Style! Tu es l’astronaute le plus génial pour moi et l’ISS, une magnifique construction humaine, la 8 eme merveille du monde, attendait ton arrivée. Elle t’aura laissé partir, c’est qu’elle n’était pas été déçue.la fuite d’eau dans ton casque me perturbe encore. Mi hai fatto vivere un po’ del tuo rientro, incredibile. Luca,con il tuo racconto ricco di particolari tecnici,personali,emotivi,accarezzi la mia curiosita e la sensibilita.spero un giorno di poterti conoscere personalmente,per poterti esprimere la mia grande ammirazione,commozione, riconoscenza per tutto cio s cui mi hai fatto ci farai partecipe.Un grande grazie verso un grande uomo simbolo vero della ns nazione.un grande abbraccio a te a katy ai tuoi bimbi. Non vedevo l’ora di leggere il tuo rientro…che belle emozioni Luca! Thank you so much for all your blog entries. I was impressed by all of them as they brought me into your experience. 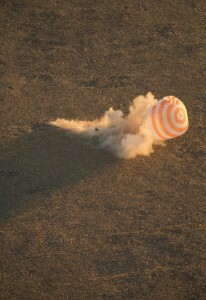 This one, which brought us into leaving the station and landing in the Soyuz, was very special. It would be hard to leave a place where every view is so wordlessly incredible, you are doing such worthwhile work, and, maybe best of all, you can fly. Thank you for sharing. Wow, a great account of what you experienced! I could see the joy on your face when you were extracted from the Soyuz, you looked like you had had the experience of a lifetime, in all sorts of ways. thank you for sharing with us. Seja bem vindo a terra!!! Che dire…hai completato il quadro con il tassello mancante!!! Ricordo bene quella notte, tanti sentimenti hanno pervaso la mia mente mentre seguivo con mio marito, in intenso contatto con i miei amici del web, conosciuti grazie alla tua pagina fb, tutti i passaggi del tuo rientro a casa. Ho provato emozione, curiosità, ansia, paura e, alla fine, tanto tanto sollievo… è stata una lunga notte ed ora so che dall’altra parte anche voi, anche se in maniera differente, avete vissuto gli stessi sentimenti!!! Grazie di cuore per aver condiviso con noi tutta questa avventura, grazie per questa “confidenza” finale… il sorriso di cui parli nel tuo racconto è lo stesso che avevi quando finalmente ti hanno estratto sano e salvo dalla Soyuz… quei minuti ci sono sembrati infiniti, eravamo in ansia e preoccupati come se lì dentro ci fosse il più caro membro della nostra famiglia… Maggiore sei diventato uno di famiglia per tutti noi e sarà un piacere poter continuare a seguirti nel tuo lavoro. Un grazie particolare va a Kathy, grande donna, che ha voluto condividere con noi i momenti successivi al tuo rientro e della riabilitazione. Grazie di esser stato il mio “amico tra le stelle”, grazie di essere l’uomo semplice che sei, un grande Italiano!!! Ci ha fatto vivere ogni giorno di questi 6 mesi, con fotografie stupende, parole mirate e intense, collegameneti e commenti di Noi…….che dal basso potevamo solo provare ammiraione, nelle sue immagini, nel vederla passare silenziosa nella notte, a bordo della ISS, pensado che una parte di Noi, il Cuore ……quello Tricolore, volava alto……….insieme e grazie a Lei. Con la sua esperienza comunicativa, visiva e emozionale, di sicuro………non smettera mai di farci entusiasmare. Con questo ……..da Ex Aviere, ma con il cuore sempre legato all’aquila dell’Aeronautica Militare, le dico………..Grazie…….per averci regalato questa magica avventura. con tutto l’affetto che provo e la stima che non smetterò mai di sentire per Te e per il tuo lavoro ti abbraccio forte…. non lasciarci soli.. continua a stare con noi!!! ormai sei uno di famiglia! Ciao Grandissimo! hai raccontato il tuo rientro in modo molto tranquillo e pacato, credo in tanti lo aspettavamo. Comunque io personalmente ti ho seguito insieme ad un gruppo di amici/che ed eravamo col cuore in gola. Ringraziando sempre a Kathy che ci ha informato di quel che succedeva, abbiamo vissuto un’avventura unica con momenti di ansia, stress ma credimi quando sei uscito con quel sorriso ci hai fatto proprio felici, io personalmente piangevo come una fontana perché eri vivacissimo. Rimarrai sempre nei nostri cuori come una persona di famiglia, grazie ancora per la tua disponibilità ed a questo punto un bacio alla tua più stretta collaboratrice. Ciao Luca e ben tornato con il tuo Blog. Leggere la descrizione così estremamente dettagliata del rientro procura veramente gioia e grazie alla tua spiccata capacità narrativa, chi legge si può sentire coinvolto e partecipe e davvero tutto questo non è affatto poco! Il peso che ti sei sentito addosso al momento dell’ingresso nell’atmosfera mi scatena mille domande e contemporaneamente mille riflessioni, persino di tipo filosofico ed esistenziale. La vita sulla Terra è peso, mentre la vita nello Spazio no, semplificando al massimo ovviamente. In questa tua riga c’è tutto il tuo amore per lo Spazio e per il volo. Ti hanno chiesto mille volte se la tua, lassù, potesse essere un’esperienza vivibile per tutti. Sebbene io non sia te, mi permetto di dire che non può essere un’esperienza per tutti, perchè può essere un’esperienza che si può fare solo con l’amore di farla e solo così si può sopportare la fatica, il rischio e ritornare a casa con e dentro un grande sorriso. Ho seguito con estremo interesse il tuo rientro seguendo, più o meno, il commento in inglese degli avvenimenti che si succedevano. Avevo assistito ad altri episodi “spaziali” come il rientro della navetta americana su siti della NASA, attraverso programmi per radioamatori ma senza provare mai l’emozione forte del tuo volo di ritorno. Il racconto letto adesso, così semplice e intenso ha rinnovato quelle ore in pochi minuti e tutto è andato a posto come in un puzzle, perchè visto da fuori è un conto, VIVERLO da dentro è tutta un’altra cosa. E questo caro Luca sei stato capace di fare, farci vivere le tue stesse emozioni. Grazie. Forse non sarò mai veramente pronto a lasciarla. Forse non l’avrò mai veramente lasciata. Caro Luca, dopo pochi giorni dal tuo ingresso sulla ISS , confesso di avere pensato che tu avessi qualcosa in più. No, non per questioni patriottiche, ma in te era evidente in ogni tuo movimento,in ogni tua parola, in ogni tua espressione, che tu eri nato per essere li e che la ISS stava solo aspettando te. Sono convinta che anche lei abbia sofferto il momento del distacco da te. Ti ho seguito per tutto il viaggio, un po’ in ansia, ma sicura che stesse andando tutto come doveva essere. Per assurdo, il momento più stressante e’ stato in quei minuti, eterni, nel’ attesa di vederti fuori dalla Soyuz. Il senso di abbandono nel chiudere la copertina di un libro ( aggiungo Che hai vissuto appieno), aspettando di aprirne uno altrettanto coinvolgente. In effetti, Luca, non è cambiato niente quaggiù ,ma nulla sarà come prima perché le esperienze servono apposta, per imparare, crescere e guardare avanti. Questa e’ stata una straordinaria esperienza per te, ma permettimelo un poco, solo un poco, anche per me. Grazie Luca, sei un maledetto MITO. Rappresenti esattamente l’antitesi di questa italietta retrograda e incapace di autodeterminarsi. Come se non bastasse, scrivi pure bene. Spero d’incontrarti un giorno e manifestarti il mio autentico apprezzamento. Importantissimo: continua la tua opera di divulgazione nelle scuole, è assolutamente fondamentale coninvolgere e ispirare le nuove generazioni. Il futuro dell’umanita’ è nello spazio, costruiamolo partendo da una rinnovata consapevolezza. Ogni bene, fratello. Bentornato a casa, Luca. Il tuo racconto è stato appassionante e commovente. Un abbraccio a te e alla tua famiglia. Wow. Great post. Love the detail and the descriptions of how you felt. I really enjoy following all the stories and information you provide us along with the insights into your thoughts and feelings about it. Thanks for this brilliantly vivid description, have shared on fb..EVERYONE should see it! How we do make progress, peacably. Un bellissimo racconto, grazie ! Orgoglioso di essere ed avere un siciliano come te! Hai reso unica la nostra terra e hai portato la nostra sicilianità nell’universo. Grazie dei tuoi racconti grazie delle tue foto grazie dei tuoi esperimenti e grazie di esistere. Spero un giorno di incontrarti e prendere un caffè con te nella nostra terra che ancora una volta sforna persone fantastiche.! Grazie Luca per aver raccontato questa bellisima avventura, ha stato como leggere un libro che mentre si continua a leggere più emozioni si sente, è come sognare vivendo per un momento tutta questa linda esperienza en 3D ma sempre nella mia imaginazione….. mi ha colpito tutte le tue fotografie dicendo dove si trovano sono certa que queste viaggio me permetterà raccontare a miei nipote in lingua Spañola……..grazie per tutta le emozione che ci hai regalato……. Se non fossi un astronauta, potresti fare lo scrittore, riesci a descrivere cose così tecniche e renderle poesia ! Ho seguito in diretta streaming tutta la fase del rientro ed è stata un’emozione indescrivibile, unica, che porterò per sempre con me, e che mai dimenticherò. Mi hai dato tanto in questi mesi, e te ne sono grato… Nutro nei tuoi confronti profonda stima, ammirazione, gratitudine, rispetto, amicizia e affetto per tutte le immense e indescrivibili emozioni condivise con noi in questi ultimi 6 mesi. Sei un uomo straordinario… Questo tuo racconto, farà parte della mia “collezione” di emozioni e sensazioni. Vederti uscire da quel che restava della Soyuz, con il sorriso, è stato incredibile. Mi sono commosso come un bambino. Ti voglio un gran bene! Mamma mia che bello. Hai spiegato tutto con semplicità, trasmettendo emozioni e dettagliati particolari come se avessimo vissuto questa esperienza li con voi. Grazie ancora di nutrire i miei sogni ogni giorno. Grazie ancora una volta per averci fatto provare anche questa emozione, quasi come averlo vissuto. P.S. il “romanzo” ci starebbe tutto, a te la decisione (secondo me, scritto a “caldo”, senza aspettare troppo, verrebbe meglio). Grazie ancora per averci fatto provare anche questa emozione, quasi come averla vissuta. Ma secondo te la fase dell atterraggio con il paracadute , rispetto “al tutto” dei voli spaziali , non é una manovra ancora molto “primitiva” ? Devo dire che questo racconto è una degna conclusione (ma spero di cuore che questo sia solo l’inizio per te) di un sogno diventato realta. Un sogno, il tuo, che abbiamo imparato a fare nostro. Io che sono siciliano come te, so che vuol dire vivere di passione, con calore, qualsiasi cosa si fa. E tu ce lo hai mostrato attraverso i tuoi racconti (che dire dettagliati è poco, sembrava essere lì con te!!! ), le immagini, tutto quanto ci ha fatto pensare ancora di più che noi siamo solo un puntino in una immensità che è l’universo. Ammirare le immagini della Terra da lassù mi ha fatto innamorare ancora di più del mio Pianeta. Leggevo, tra i commenti, che qualcuno che si augurava che questi tuoi racconti potessi farli un giorno nelle scuole al tuo rientro in Italia. Sarebbe una cosa meravigliosa per i giovani riscoprire la bellezza di tutto quanto tu hai vissuto lassù in questi mesi. Grazie ancora per tutto….sei un’orgoglio Italiano, e nessuno me ne voglia, sei un’orgoglio soprattutto Siciliano!!! Très Heureuse de vous savoir en très bonne santé. Luca, per mesi ho spulciato la tua bacheca Facebook, ammirato i tuoi scatti e letto il tuo blog. E’ sempre sembrato essere li con te… è sempre stato emozionante “essere” li con te. Grazie di tutto! Spero questo sia per te (e per noi) solo un arrivederci allo spazio. sei grande Luca, aspettavo proprio questo, la discesa e le emozioni.Grazie ciao!!!!!!!!!!!!!!!!!!!!!!!!! che lettura splendida!!! sembrava di essere a bordo. Dovresti scrivere un libro. Grande Luca, sei un mito. Parole più vive di un filmato. Complimenti.